The Eurasian otter is an aquatic mammal belonging to the Mutelidae family together with weasels and badgers. It is also called the elusive common otter and measures an average of 14 lbs in weight and about 16 inches in length. It is able to generate heat internally thus is "endothermic." The Eurasian otter is chiefly brown on its upper side while its underside is cream-colored. It has a long slim body with a thick tail and legs which are short. 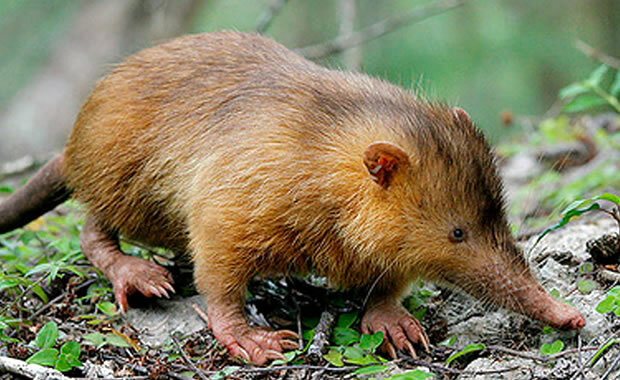 It is covered with short fur that usually traps air to keep it warm. It also has a small nose and ears both of which can be closed while in water. The feet of the Eurasian otter are webbed. The Eurasian otter feeds on small fish such as carps and minnows. Juveniles are usually known to feed on invertebrates. This aquatic mammal can be found in habitats such as coastal lines, clean rivers and lakes where the water is fresh. Eurasian otters need fresh water to clean up their coats of fur in order to maintain their insulation quality. They breed throughout the year and can mate either on land or in water. Most mating occurs between February and July after which the expectant female gestates for about 60 to 70 days. The female bears two or three cubs which are weaned at the third month. At birth, the young weigh about 4.2 ounces, and their eyes are usually closed. The cubs open their eyes after one month and by the second month they start leaving their nest. The Eurasian otter is threatened by a number of factors including being hunted and killed for its fur, and pollution and loss of habitat. Other threats include bearing few cubs per litter, having a short life span (four years) and having a long maternal care period. The population of the Eurasian otter has not been estimated in some areas where it occurs, particularly in Asia and North Africa. There are just over 10,000 individuals in the United Kingdom. Some of the conservation measures that have helped reduce the rate by which the Eurasian otter is declining are the following: listing on Appendix I of CITES, Bern Convention has listed it on Appendix II, EU Habitats and Species Directives has listed it on Annexes II and IV. The Eurasian otter is also listed as endangered in many Asian countries where it occurs. Another action that has helped is the establishment of a breeding program in Europe (established in 1985). Also, there have been establishments of several monitoring and reintroduction programs in countries such as the United Kingdom, Netherlands and Sweden among others. Copyright Notice: This article is licensed under the GNU Free Documentation License. It uses material from the Wikipedia article "Eurasian otter". Glenn, C. R. 2006. "Earth's Endangered Creatures - Eurasian Otter Facts" (Online). Accessed 4/25/2019 at http://earthsendangered.com/profile.asp?sp=11405&ID=1. Need more Eurasian Otter facts?